The sound of lots of voices outside our room woke me up just past seven, and when I stepped outside I saw a huge group of people looking very cold and attacking the breakfast buffet. Where had they come from? The riad was rather small, there were not near enough rooms for all that people. It turns out that they had spent the night in the desert to see the sunset and the sunrise among the dunes – most riads have a camp set up somewhere in the Erg Chebbi and hosts can choose to spend the night there instead of the riad. After about an hour ride on camels, people have dinner, see the sunset, spend the night in a bereber tent, see the sunrise and go back to the riad for breakfast. On the way down here we had taken a new road that goes straight through the desert from Erfoud to Merzouga, saving us half an hour and the hassle of crossing Rissani, but at the same time missing out on the town that had been the capital of the country in the 14th century and one of the many recommendations that our host in Errachidia had made – bereber pizza. 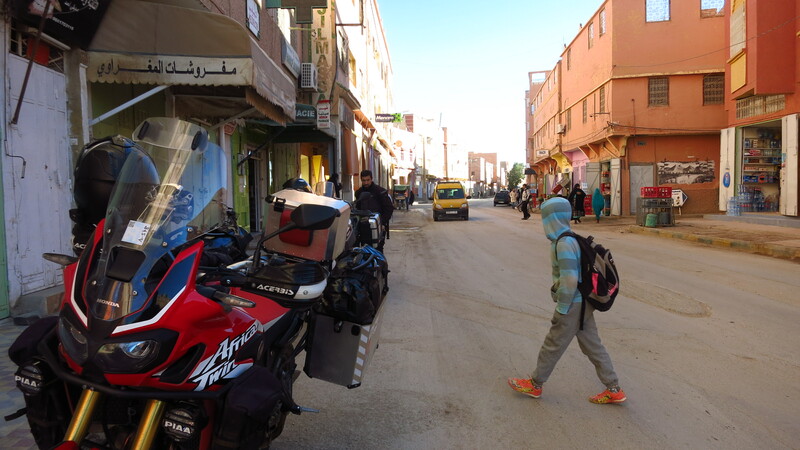 However, the route to Ouarzazate took us back there, so at least we got a quick tour of the city from the bikes. We missed out on the pizza however, as the only place we found open so early in the morning told us that we would had to wait for almost an hour before we could get one to take away and we had a long day’s ride ahead of us, so we decided to move on. The views we found on the road after Rissani more than made up for it, though. The landscape was amazing, the snow covered Atlas mountains were to our right, and all around us was rocky desert with beautiful rock formations and low hills. 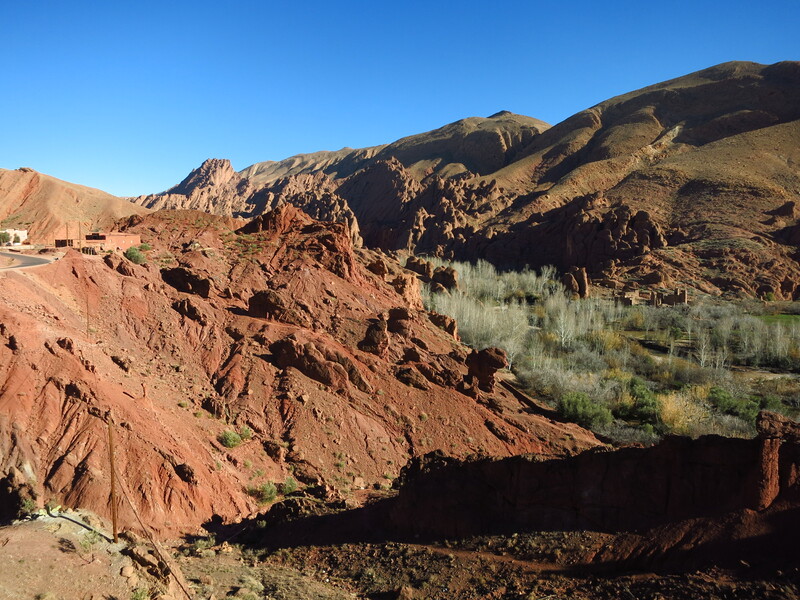 When we reached Alnif we turned north on a smaller regional road until we reached Tinghir, and from there we rode up the river Todra and visited the Gorges du Todra. They are a narrow canyon where the road zigzags at the botom along the river, with imposing tall rock walls on both sides. We rode up the river until the canyon opened again, then stopped to see the views and check the route to our next stop – the Gorges du Dades. 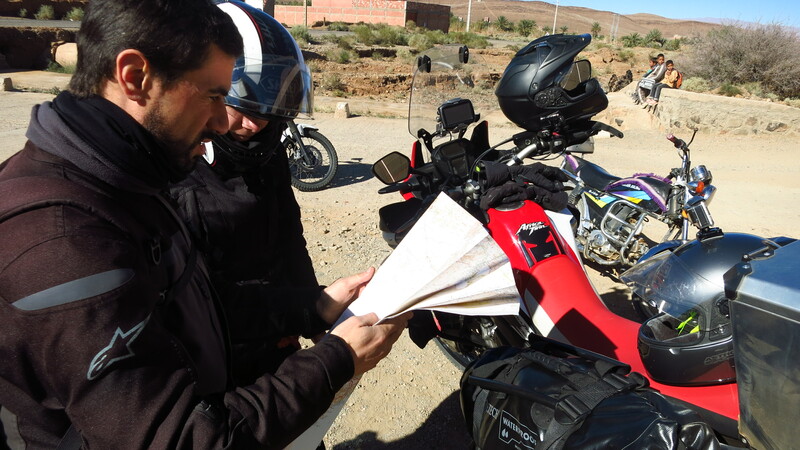 When we took out the map we realised that the road continued up the river, into the mountains and then down again into the Gorges du Dades, which was bound to be a more interesting route than going back down to the national road and then up the Gorges. The problem was that we had not counted on that, and we were all low on fuel. If we wanted to take that route we needed to go back to Tinghir to fill up the bikes, which would add well over half an hour to an almost two hour detour, and we were already running against the clock to make it to Ouarzazate before sunset, so we reluctantly decided to go on with the normal route. 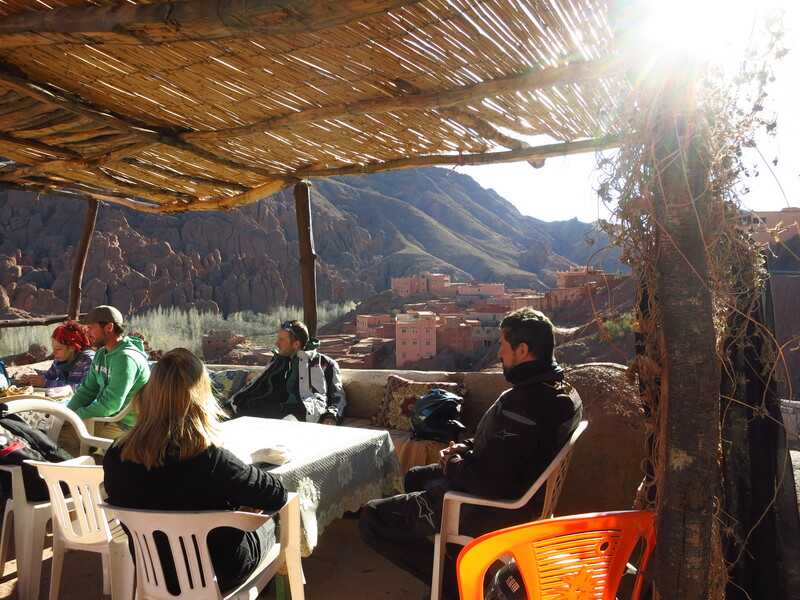 We were starting to feel tired when we turned into the Gorges du Dades, so when we saw a café with a terrace overlooking the rock formations across the river we stopped for a well deserved rest. We got back on the main road happy to see that there were only 90km to get to our hotel, but little did we know that they were going to be a hard 90km… We were riding straight into the sunset, and unlike the sunset on our first day, when we were riding across Spain, there were no hills or corners here to hide the sun from time to time, and we were not in the relative safety of a European motorway, so our eyes were exposed to unrelenting torture and we could barely see incoming traffic, potholes or what is worse, pedestrians, cyclists, mopeds and animals on our side of the road. While my bike and Esteve’s had low windscreens, Gerard had recently had a taller one fitted, meaning that he had to look through it, making it all but impossible to see the road. To make matters worse, the road went through lots of towns and villages, further slowing our progress. Things only got better once the sun set, but that meant that we had barely half an hour of light left to reach the hotel. 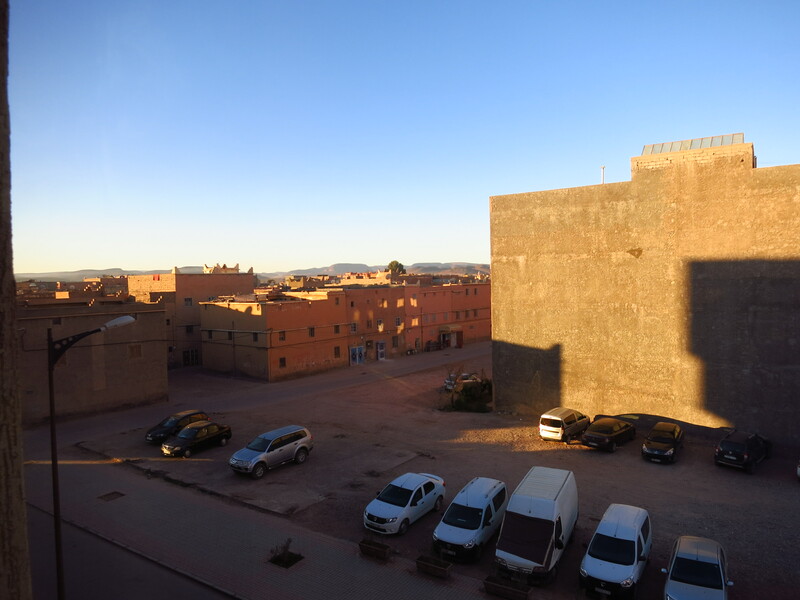 Luckly, we made it into Ouarzazate just in time, and we were glad to see that getting to the hotel was straightaway – no navigating through heavy traffic or narrow streets. There was one last problem when the guy at the hotel told us that the ‘parking facilities’ mentioned in the website was an empty lot opposite the building. 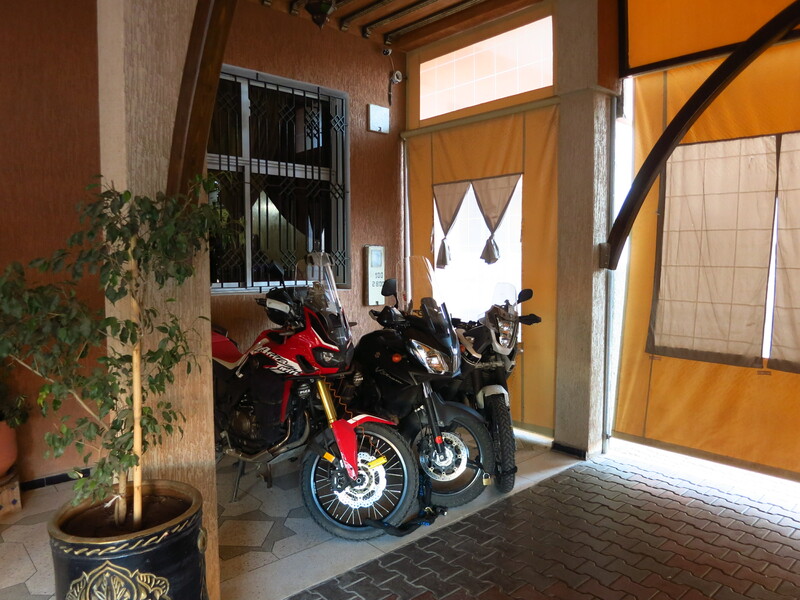 We told him that we did not want to leave the bikes there and in the end they cleared some tables and chairs from the hotel café terrace right by the entrance door and let us park the bikes there, under the reception window and within view of a security camera.